You’ve seen them on the runway, you’ve heard about their popularity, and now they’ve made a splash in my industry. The 2 Stone Custom Engagement Ring is catching up with the single stone solitaire. We see double everywhere, even in the wedding scene. Aside from trendy engagement rings, 2 Stone Custom Engagement Ring holds great appeal as anniversary gifts and right-hand rings. 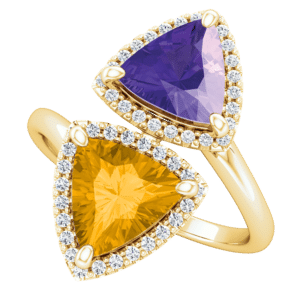 You may be wondering to yourself, “Can I even afford two stones in one ring?” If this fast-moving trend causes concern, fear not! These were all created with flexible designs, allowing easy adjustment to metal type, stone size, type, and quality. For example, take a look at this Iris flower-inspired look. The richness of purple Amethyst contrasts well with the Citrine, while the yellow gold adds a regal richness. These stones are also at a great price point. Who says elegance has to break the bank? Whether you’re in the mood for a floral motif or a juicy watermelon, these two colors fit the bill. 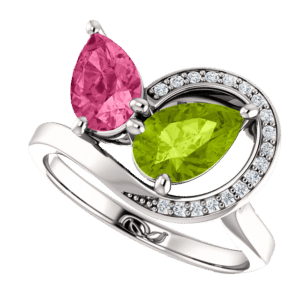 We set the Pink Tourmaline and Peridot stones in white gold to make the bold colors pop. 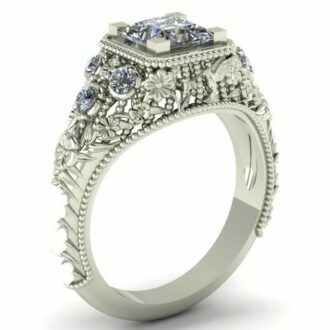 This unique style and color combination will definitely start a conversation with anyone who likes interesting jewelry or 2 Stone Custom Engagement Ring design. Want a bolder 2 Stone Custom Engagement Ring look? Try Blue Sapphire and Ruby, the epitome of royalty and power. These two timeless classics will never go out of style and make perfect heirlooms. Setting them in white gold helps to set off their boldness. And if you aren’t a fan of this color combo, try adding a personal touch, like a birthstone. Looking for a simpler 2 Stone Custom Engagement Ring? 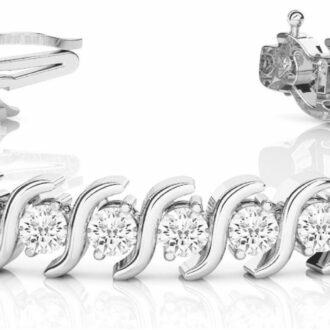 Try the 2 stone bypass solitaire ring. This ring is a blank slate; add color to the metal and almost any stone is available to you, so make it your own. 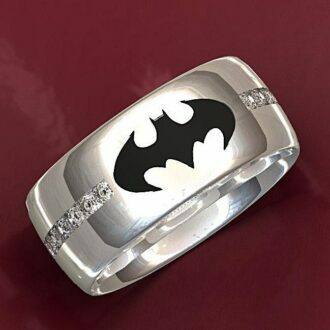 These are just ideas for a 2 Stone Custom Engagement Ring. Let us make your idea into a piece of jewelry!